If you’re anything like me, you fall headlong into summer with all the love and plans and sunscreen your tote can carry. Every new season brings high hopes, but my summer hopes are usually astronomical. 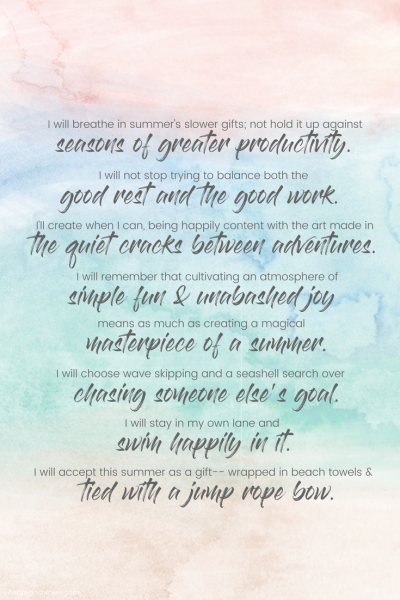 If you’re also like me, you may get to August and have a mental list of all the things you didn’t accomplish in your home, your work, your art, in anything. For many of us, that can sour a summer before we transition to fall. I believe in having a summer list of things that mean the most. I also believe in having a list of things I won’t do this summer. Last year I scrawled out a few markers for the slice of time between May and August. This year, I revisited my list. It helps me to have a heart guide for what can be the most carefree time of year. Do you make lists like this? I hope this will be a kind reminder for you as it already has been for me. Not a list of rules, but of the kind of boundaries that give us more spontaneity and freedom. I will open my hands to the swelter of June and July and collect its’ slower gifts. I will breathe in summer, not hold it up against seasons of greater productivity. I will create when I can; be happily content with the art made in the quiet cracks between summer adventures. I will smile at these days of fluidity and fun, instead of scoff at their limited productivity. I will invite my children into the creative fun and remember that messy makes good memories. I will not stop trying to balance both the good rest & the good work. I will see beauty in a period of less and embrace the knowledge that if rest is offered me, rest is where I am most needed. I will eat popsicles with my children, and know again the drippy, sticky, happiness of being nine years old. I will focus on the faces in front of me. I will notice new constellations of freckles on her nose. I will see the way his eyes reflect the pool blue of the deep end. I will remember that cultivating an atmosphere of simple fun and unabashed joy— means as much as creating a magical masterpiece of a summer. I will choose wave skipping and a seashell search over chasing someone else’s goal. I will stay in my own lane and swim happily in it. I will take this summer, however it looks, with my whole heart and I will not make it smaller by comparison. 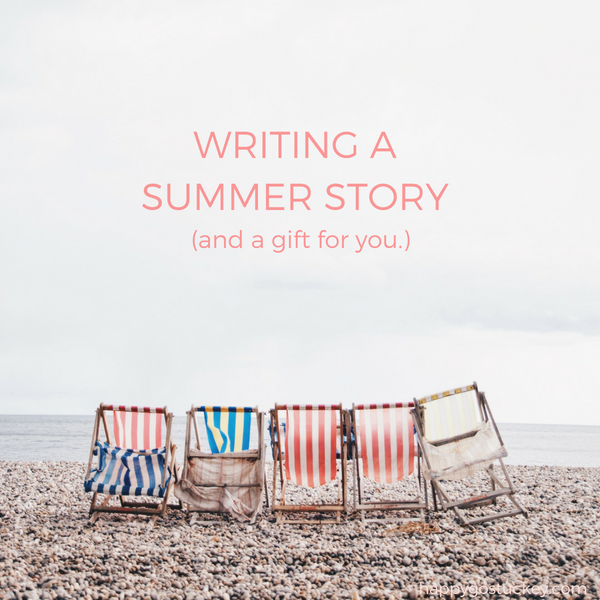 We will remember that this summer, our summer, is a gift wrapped in beach towels and tied with a jump rope bow— and we will love every minute of it. 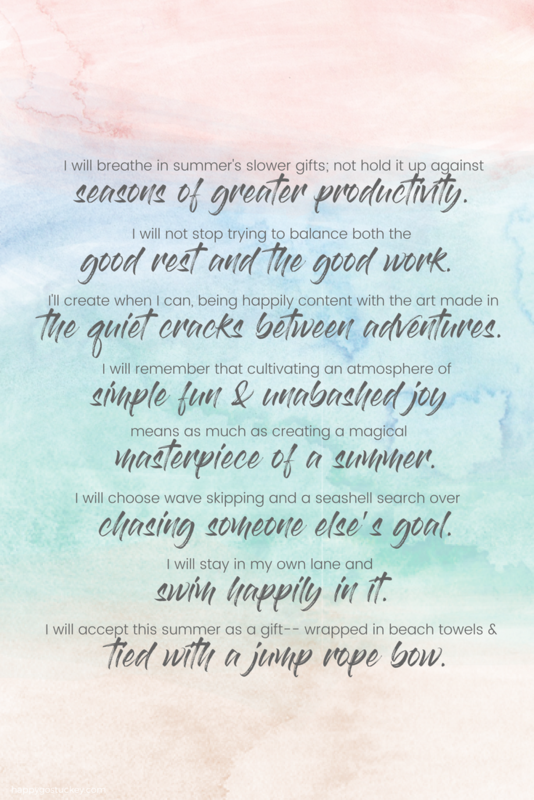 And because many of you, like myself– enjoy a reminder made pretty, here is a printable version of just a few of these lines. To get your own copy, click here and download the PDF version. Cindy, great post! My bible study is going over how good boundaries create freedom in our lives and this is right in line with that! 🙂 Thanks for the printable, I’m giving one to all the girls in our group!